Island Style Red Snapper - Red snapper fillets, olive oil, green peppers (capsicum), garlic, Spanish onion, hot pepper sauce. Spicy West Indies Snapper - Snapper fillets, curry powder, cumin, paprika, allspice, ginger, salt, black pepper, lime juice, red onion. Bali Baked Snapper - Snapper fillets, onion, garlic, ginger, tamarind paste, sesame oil, cumin, mint, lemon juice. Snapper - A mild to medium sweet flavored fish, with firm white flesh and a low oil content. 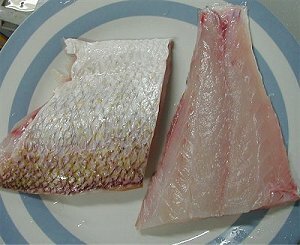 Snapper are easy to fillet, and the bones are large, and easily removed. A very versatile fish, for pan frying, barbeques, grilling or broiling, steaming and baking. Red Snapper in Coconut Sauce - Red snapper fillets, onion, garlic, ginger, chili, lemongrass, cinnamon, cloves, cardamom, turmeric, cumin, coconut milk, coriander, lime. Roasted Red Snapper - Snapper fillets, tomato, green onions, lemon juice, oregano, coriander, feta cheese, olives. Red Snapper w. Broccoli & Dill Cheese Sauce - Snapper Fillets, broccoli, milk, cheddar cheese, dill. Blackened Red Snapper - Snapper fillets, onion powder, garlic powder, dry mustard, thyme, chili. Greek Style Red Snapper - Red snapper fillets, red onion, lemon juice, tomatoes, parsley, feta cheese. Red Snapper with Lemon Marjoram Butter - Red Snapper fillets, butter, lemon zest, lemon juice, marjoram, olive oil. Snapper with Tomato Orange Sauce - Snapper fillets, red tomato, yellow tomato, white wine, orange rind, orange juice, turmeric, garlic. Red Snapper with Shrimp Stuffing - Red Snapper fillets, celery, onion, garlic, dill, bacon, breadcrumbs, shrimp, egg.